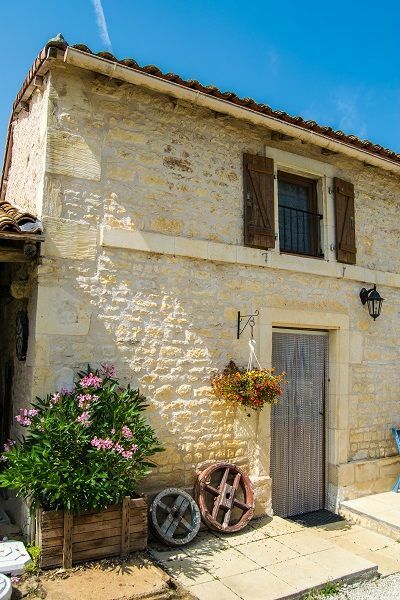 An enchanting little cottage (sleeps 5 plus a baby), completely renovated in 2007 and recently redecorated, this 2 storey gite which is full of character. The original bread oven is a feature of the living area and lovely old beams are on show throughout. On the first floor you will find a spacious double bedroom which is capable of taking a single folding bed and cot and a bright and airy modern shower room. The bedroom is equipped with a wardrobe, chest of drawers, bedside cabinets, a mirror, hairdryer and a velux window from which to view the stars at night. Bath, hand and tea towels are provided as is bed linen, duvets and pillows, and we can provide a travel cot and bedding should this be required. Pool towels can be provided on request. Downstairs is a large, airy, well lit living/dining/kitchen area with a double sofa bed. The kitchen area is fully equipped with fridge, freezer, cooker with fan assisted oven, microwave, toaster, kettle, filter coffee maker and all the pots pans cutlery and utensils you could possibly need. The living area benefits from a flat screen TV with Freesat English channels, cd/dvd player, dining table and chairs and 2 rockers in addition to the double sofa bed. A welcome pack containing the basics is provided upon your arrival free of charge, but should you wish us to get your shopping this can be arranged and we can settle up when you arrive. Outside you can enjoy the morning sun and take breakfast, lunch and dinner on your own patio where you have your own wooden table, chairs and parasol. Next door is a large open hanger which contains table tennis and a pool table, conservatory furniture and many games etc. for you to enjoy. There is a laundry room where you will find a washing machine, iron and ironing board for your use, and just around the corner is the fenced swimming pool area. 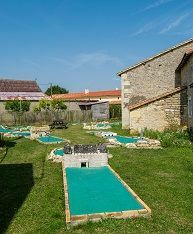 Sunbeds (2 per gite) are provided and there is a barbeque and ample seating and dining areas overlooking the pool area which is also where you will find the children’s play area with swings and slide.